The inaugural ‘two-plus-two dialogue’ between India and the US will be held on September 6 in New Delhi, the State Department announced on Friday. Last month, the US had postponed the much-awaited dialogue due to “unavoidable reasons”. Secretary of State Mike Pompeo and Defence Secretary James Mattis would travel to India for the dialogue. “The United States is pleased to announce that the inaugural US-India ‘2+2 dialogue’ will be held in New Delhi, India, on September 6,” State Department Spokesperson Heather Nauert said in a statement. Pompeo and Mattis “look forward to meeting with their Indian counterparts,” Minister of External Affairs Sushma Swaraj and Minister of Defence Nirmala Sitharaman, “to discuss strengthening strategic, security and defence cooperation” as the US and India jointly address challenges in the Indo-Pacific region and beyond, Nauert said. The dialogue was announced last year during Prime Minister Narendra Modi’s meeting with President Donald Trump at the White House. After June last year, the two countries have tried to schedule the dialogue many times with several dates having been considered. Last month, the US postponed the dialogue scheduled to be held in Washington due to “unavoidable reasons”. The dialogue is seen as a vehicle to elevate the strategic relationship between the two countries. Meanwhile, a senior State Department official told reporters that the co-operation among quad countries – the US, Japan, India and Australia – would come up in the next week’s US-Australia Ministerial Consultations in Palo Alto. “I think it will publicly come up in the course of the discussions. We’ve been encouraged by the two quad meetings that have taken place at the assistant secretary level to date, and we look forward to continuing holding these meetings,” the official said. “We believe it’s a constructive way for like-minded nations in the region to have a chance to share views and to coordinate to the extent possible to ensure that we reach our mutual objectives in the region. “Our fundamental objectives are laid out in our Indo-Pacific strategy, and I think whether it’s Australia, the US, Japan or India, we all have some very close-held, very similar views on the fundamental importance of maintaining a rules-based system and international norms, our commitment to free and open markets, all these things,” the official said. The announcement of the ‘two-plus-two dialogue’ comes amidst prospects of India being imposed with unintended sanctions that are targeted at Iran and Russia. “The unfortunate reality is that India has been caught in the crossfire of the Trump administration’s secondary sanctions against both Russia and Iran. “Although this is undoubtedly a serious challenge in the bilateral relationship, it is not insurmountable. Both sides will have to focus their efforts in finding a solution that preserves both their respective interests,” Ronak Desai, vice-chair, India Practice at Steptoe & Johnson LLP, told PTI. In the past, the US recognised the central role Iranian crude oil plays in India’s energy security. At the same time, New Delhi gradually curtailed its oil imports to comply with US secondary sanctions and secure the requisite waivers from Washington. “In this instance, India has already begun reducing its oil supply from Iran, but it is unlikely that it can, or will, do so completely,” he said. Desai said it is important to remember that the US and India have confronted the threat of sanctions stemming from India’s purchases of Iranian oil in the past. It did so successfully, with both sides working together to recognise and preserve each other’s respective interests as they are related to Iran, he said. “The challenge facing the US-India bilateral relations now is not new. Mechanisms are already in place to begin addressing it in a way that doesn’t undermine the integrity of the strategic partnership,” Desai said. He added that India wants the US to recognise that its purchase of the S-400 air defence system from Russia is a legacy decision that predates the enactment of CAATSA. Some US lawmakers are working to get a waiver for India from the punitive Countering America’s Adversaries Through Sanctions ACT (CAATSA), under which sanctions kick off on countries that purchase significant military equipment from Russia. Much of India’s defence equipment historically comes from Russia and as a result, New Delhi must maintain its relationship with Moscow in this arena, Desai said. “But the reality is that US-India defence trade is rapidly expanding, and it would be a tragedy for that burgeoning relationship to be compromised by the CAATSA decision,” he said, adding that ultimately, the US and India are partners, partners who have effectively overcome far more formidable challenges in the past. 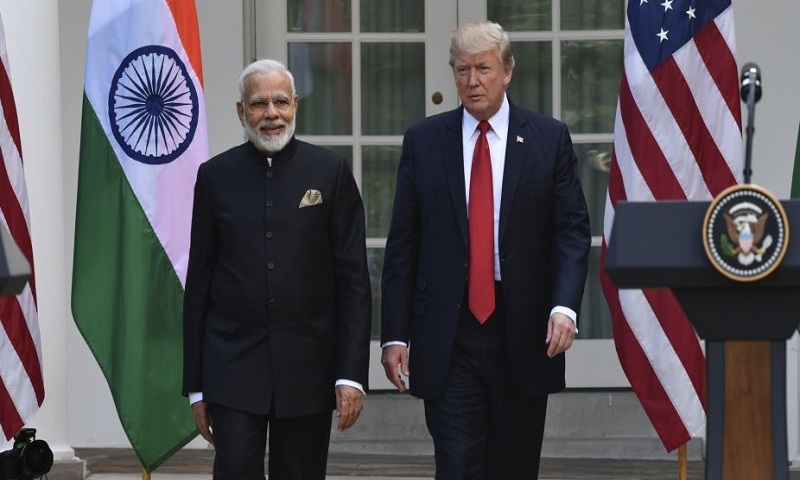 “It is time for both sides to once again demonstrate that the rhetoric of the US-India relationship matches the reality, and find a pathway forward that addresses the sanctions issues without jeopardising the overall upwards trajectory of the partnership,” Desai added.